Anthracnose is caused by the fungus Colletotrichum orbiculare (syn. Colletotrichum lagenarium). The disease is easily diagnosed with a hand lens or microscope when whisker-like setae (hairs) can be seen in the pink spore masses (Figure 1). Figure 1. 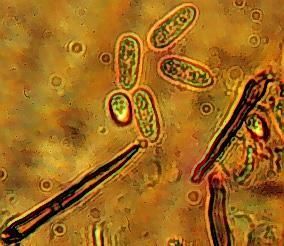 Setae and conidia of Colletotrichum, as viewed under the microscope. Anthracnose of cucurbits is widely distributed over the world wherever cucurbits are grown. The disease is common in North Carolina. 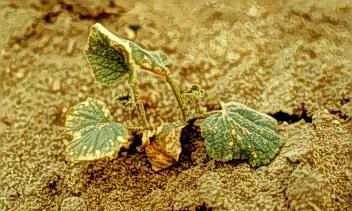 Anthracnose causes serious losses when susceptible cultivars of cucumber (Figure 2) and watermelon are grown. Most cultivars of honeydew melon are very susceptible and this disease is a limiting factor in melon production in the eastern United States. Cantaloupe, squash, and pumpkin are less susceptible to anthracnose but occasionally the disease causes losses on the fruit. Figure 2. Anthracnose in a cucumber field. Leaves, stems, petioles and fruit can be affected. The symptoms of anthracnose vary somewhat on different hosts. 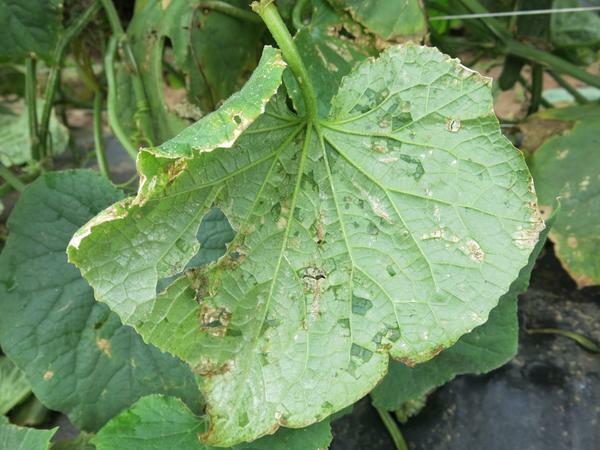 On cucumber leaves the spots start as water soaked areas and expand into brown spots which are roughly circular, reaching about 1⁄4 to 1⁄2 inch in diameter (Figure 3 & Figure 5). Small, growing leaves may be distorted and severe spotting may cause entire leaves to blight (Figure 4). Lesions on watermelon leaves can also appear circular at first, but later coalesce into more irregular necrotic areas (Figure 6). Leaf petiole and stem lesions are shallow, elongate and tan. Lesions on fruit are roughly circular, sunken and contain pinkish spore masses in moist weather. 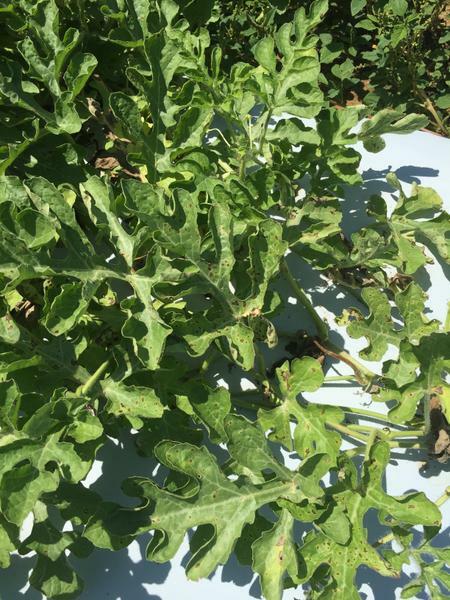 Spots on watermelon foliage are black, and a foliar blight may develop giving a scorched appearance to the planting. The lesions on stem and fruit are similar to cucumber. Figure 3. 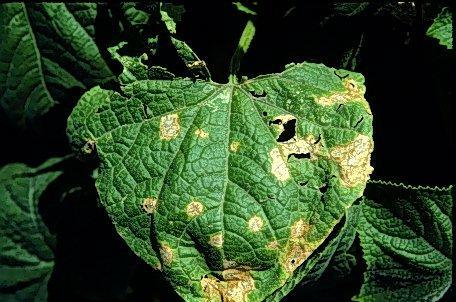 Cucumber leaf with lesions caused by the anthracnose fungus. Figure 4. Cucumber seedling with anthracnose symptoms. Figure 5. Anthracnose on cucumber leaf. Figure 6. Anthracnose on watermelon leaf. Figure 7. 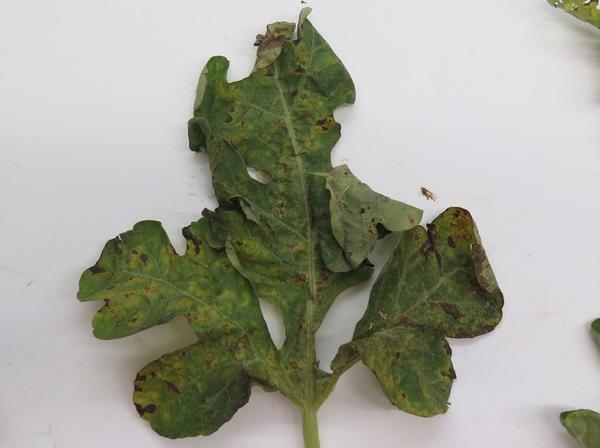 Alternaria leaf blight on watermelon. Figure 9. Angular, yellow lesions on topside of the leaves that are bound by leaf veins. Figure 10. 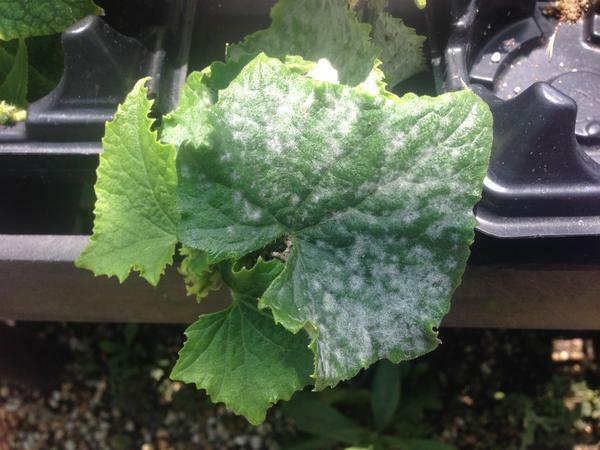 Powdery mildew on cucumber. Figure 11. Phytophthora leaf blight. Warm, humid, and rainy weather at frequent intervals is necessary for disease development. The fungus may live two years in the absence of a suitable host. The fungus can be seed-borne and this is often the source of primary inoculum. The spores depend upon water for spread and infection. Spread by wash water on harvested fruit is important when cucumbers or melons are cleaned before packing. Spores may also be spread by cultivating equipment or workers when the foliage is wet. The spotted or striped cucumber beetle can carry the spores from plant to plant within a field or to adjoining fields. Disease-free seed is desirable, consider seed treatments to ensure no pathogens are present. Practice at least a one year, preferably two or three, rotation away from cucurbit crops. Avoid moving machinery or workers in the fields when the foliage is wet. If overhead irrigation is necessary, irrigate in the early morning so the foliage will dry before nightfall. Resistant cultivars of watermelon, pickling and slicing cucumbers are available with desirable horticultural characteristics. A number of North Carolina growers have found that a second crop of cucumbers can be profitable and pickle processing plants want an extended fresh pack season. Diseases such as anthracnose, however, have been much more severe in late summer planted cucumbers. Growers have found that cucumber following cucumber is the most efficient use of land. The interval between crops may be less than a week and does not allow for the previous crop debris to be sufficiently decayed to destroy the anthracnose organism. Late summer cucumbers are exposed to more fungus spores and have increased chances of becoming infected. They are usually planted in late July or early August when the temperature is most favorable for the fungus. In those years when rainfall is above normal, conditions are such that a disease epidemic can develop. While a number of cucumber cultivars are resistant to anthracnose, this resistance is not complete. 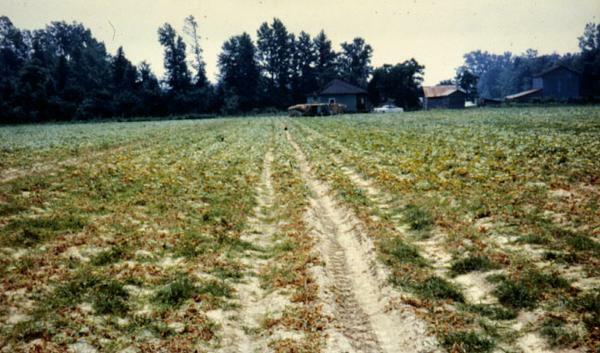 It is usually high enough for a spring planting to survive the growing season; however, a late summer planting may be destroyed several weeks prematurely. If an infested field must be planted because a two year rotation is not possible, then the grower should "flip plow" the field with a modified moldboard plow. However, this approach will only be useful for one year since spores will come back to the surface when the soil is "flip plowed" again. 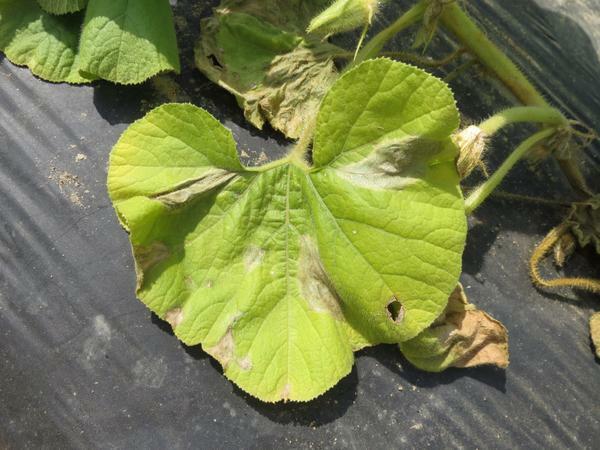 Fungicides are not usually profitable for anthracnose control on watermelons and spring planted cucumbers when other control practices, such as crop rotation and resistant cultivars, are used. Fungicides should be used on late summer cucumbers in addition to the use of a resistant cultivar. Begin spraying with first appearance of the disease, then spray every 5 to 10 days. Use the shorter time interval during rainy weather. For the latest fungicide recommendations for Anthracnose of cucurbits see the Southeastern US Vegetable Crop Handbook. Fungicide labels are legal documents, always read and follow fungicide labels. This factsheet was prepared by the NCSU Vegetable Pathology Lab in 2013.